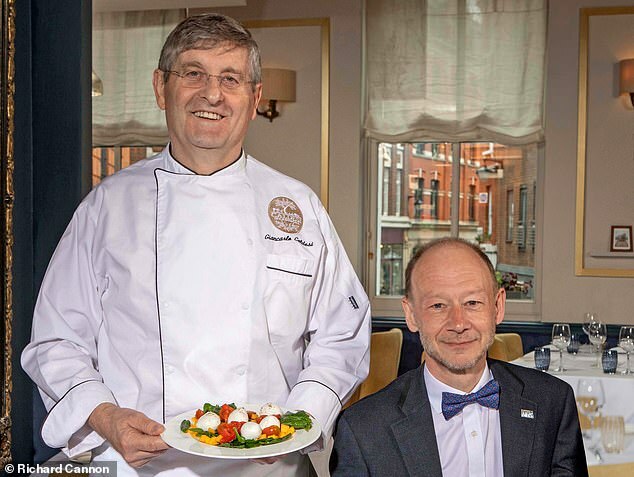 Today, in the third part of our groundbreaking series, NHS GP Dr David Unwin reveals the tricks to keep you motivated to stick to the low-carb plan, while chef Giancarlo Caldesi and his food writer wife Katie offer more of their delicious recipes. When my lovely wife Jen and I married 25 years ago, I didn’t realise I was getting far more than a spouse! Jen is an NHS consultant clinical health psychologist — working in a field that, back then, I thought was a bit nebulous, not real medicine. As a young GP, I was full of my own importance and thought a good knowledge of the medical tests I used and the drugs I prescribed was far more important than wishy-washy stuff like psychology. How on earth could that help problems such as type 2 diabetes? What a lot I had to learn. The problem was that my drugs didn’t always work. I was beginning to suspect I was missing something important about medicine, when Jen started her research into the role of hope in chronic disease. It turns out that more hopeful people live longer. But how do you bring hope into ten-minute GP appointments? Jen taught me to ask about hope rather than fear, to help patients find the motivation to make the changes that would make a difference. So, for example, when seeing someone with a severe weight problem, rather than telling them about all the risks, it could be better to find out how their lives might be improved if they did manage to shed that excess weight. This can make a huge difference to the motivation needed to make successful lifestyle changes — such as a new diet. When I started a low-carb group in my GP practice in 2013, Jen would need to play a key role. By talking to patients of their hopes about obesity and type 2 diabetes, it became clear how much interest there is in taking control of one’s medical condition. Given a choice of trying to improve one’s lifestyle with support, or starting lifelong medication, hardly any patients go for the drugs. While this helps with the overall picture, there will be moments when anyone who’s been on a high-carb diet can struggle. Here is the advice Jen used to help my patients; we hope it helps you. 1. Focus on your motivation. Think about why you want to change the way you eat. Do you want to come off medication, for instance, regain your energy or get fit for a hobby or activity? Focus on how much better your life would be with those changes. 2. We all overestimate willpower! For most of us it wanes after a few weeks when the novelty has worn off. This makes us susceptible to lapsing when we are tired or stressed. So clear cupboards of foods you don’t want to eat. If you do need to keep starchy foods for other family members put them on another shelf and buy portion-sized packages such as one-person bags of microwaveable rice. This way you won’t be tempted to ‘have a bit’ if cooking for someone else. 3. Sugar and carbohydrates are ‘feel-good’ due to the effect they have on the brain, causing the release of endorphins — hormones that produce feelings of happiness and contentment. Be aware of this and try to find non-food ways of boosting your mood. Take a walk, download your favourite TV box set, or take up a hobby to distract you. Make these treats part of your week so you can look forward to them. 4. Keep motivated by swapping ideas with others on the same mission. One good online community is diabetes.co.uk/forum and click on low-carb diet forum. 5. Break big goals into little ones. You may have a certain weight goal, but this can take time, so keep your enthusiasm up by celebrating smaller milestones; whether it’s a week without biscuits, an encouraging blood sugar reading, or a few pounds fewer on the scales. 6. Accept that you will make mistakes. From time to time you will eat the wrong things. The important thing is to pick yourself up and get back on to your low-carb diet the next day. Many of us learn from our mistakes. Ask yourself how you would handle things differently next time? 7. Be honest with yourself. Are you struggling more than you expected to make changes to your diet? Sugar is a highly addictive substance and you could actually be a sugar addict. If you are, it’s best to face up to this: you’ll find it much easier in the long run. We’ll examine sugar and carb addiction in more detail in tomorrow’s Daily Mail and offer tips. 8. Find your own formula. The long-term goal is to eat less often, snack less and eat real foods, but you will have to find the best way to adapt this to fit with your lifestyle. This is why the plan is flexible. So, for instance, you may at first need to schedule in a mid-afternoon snack. Find what works for you. Learning to give up something you’ve loved for so long can be a very long process. It took me a year to come to terms with not eating carbs, and three to stop craving them, even though giving up had transformed my health. At first, food was still an obsession for me — like being madly in love, I could think of little else. Every now and then, I would lapse and eat some cake or chocolate because I’d let myself forget how awful it made me feel. Then, six years ago, stopping for petrol on a busy dual carriageway in North London one night, I bought a small bar of chocolate. Within minutes of eating it I could see nothing apart from the flashing of headlights and streetlights. I managed to reduce my speed gradually and pull over. I was deeply shaken and this gave me the wake-up call I needed to embrace the low-carb mindset for life. Don’t trust the sneaky voice in your head that tells you ‘just one’ won’t matter, particularly in the early days. You never know where it will lead. Clear away temptation, particularly at home. Always have an alternative reward to hand. For me, that’s a few nuts and a bottle of water or, if I’m desperate, a square or two of 90 per cent dark chocolate. Your taste buds will change. Now I can’t believe how naturally sweet an apple tastes. 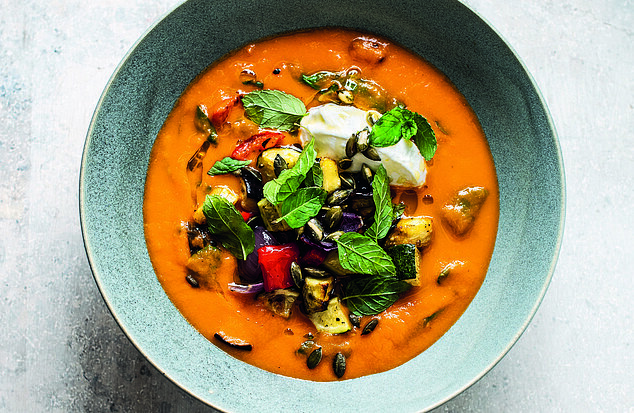 We love this hearty soup packed with Mediterranean flavours. The low-carb swede means you don’t need potato or flour for thickening. Preheat the oven to 220c/gas 7. For the tomato base, heat the oil and fry the vegetables and thyme for 10 minutes. Add the tomatoes and basil then stock or water. Bring to the boil, then reduce the heat and simmer until the vegetables soften. Meanwhile, put the roasting vegetables on an oven tray and toss in the oil and seasoning, tucking the rosemary underneath and roast for 20-25 minutes. Whizz the tomato base in a blender, return to the pan and stir in the spinach and season. Serve, topped with mint, roasted vegetables, goat’s cheese and seeds. 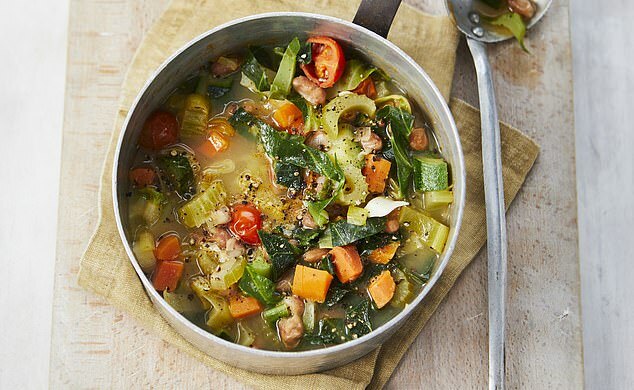 This filling soup really hits the spot on flavour and can go from the chopping board to the serving bowl in 15 minutes. We like the crunch of peanuts at the end but they can be left out if you prefer. Take the garlic, ginger and chilli, season, then fry in the coconut oil for a few minutes. Add the broccoli and coriander and stir through. Pour in the coconut milk then fill the empty tin with warm water and add this too. Bring to the boil, reduce the heat and let the soup bubble gently for 5-7 minutes until the broccoli stalks are tender. Meanwhile, dry fry the peanuts, if using, until lightly browned, remove and roughly chop. Take the soup off the heat and use a hand blender to whizz it to a smooth consistency. 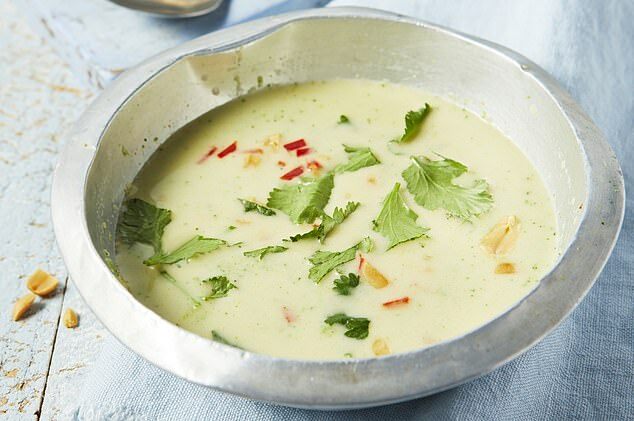 Pour into warm bowls and garnish with coriander leaves, peanuts and black pepper. 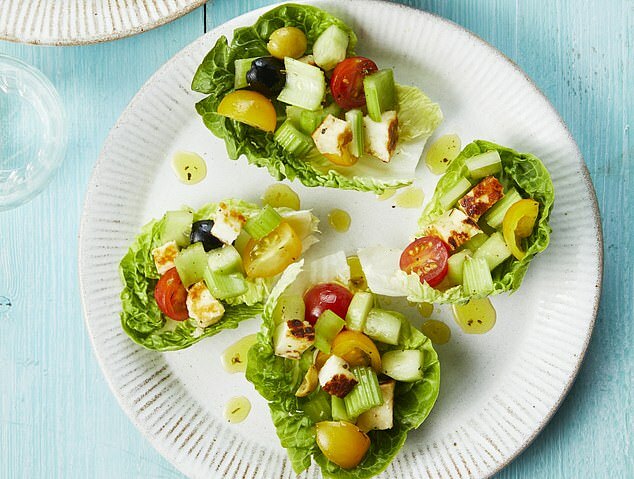 The combination of hot halloumi with cool salad is wonderful. You can prepare the salad as the cheese cooks, so in 10 minutes you’ll have a bowl full of goodness ready to eat. Change the vegetables according to what’s in season and in your fridge. Trim the lettuce and arrange the leaves on two serving plates. Dry fry the halloumi in a non-stick pan until golden brown. Meanwhile, mix the remaining ingredients together in a large bowl. Taste and adjust the seasoning and lemon juice as necessary. Add the warm halloumi and mix gently. Spoon into the lettuce leaves and serve straight away. This is so easy to make and incredibly tasty for just a handful of ingredients. 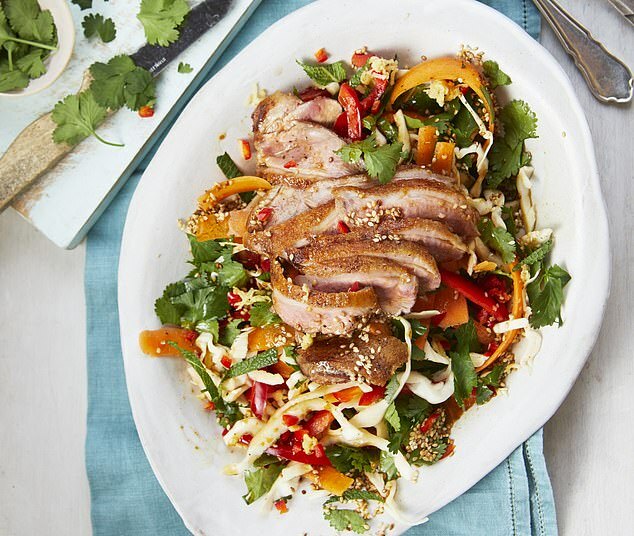 Check your spice powder is not already salted before you add it to the duck. Toast the sesame seeds briefly in a small pan until golden brown. Tip out on to a plate and set aside. Rub the salt and five-spice powder into the duck breasts. Put them into a cold, dry, non-stick frying pan, skin-side down, and cook for 10 minutes over a medium heat. Cook the breasts on the other side for about 5 minutes then remove from the pan and leave to rest on a warm plate for 10 minutes. Mix the salad ingredients together in a large bowl. Add the dressing ingredients to a small jug, stir and pour over the salad. Toss together and divide into two bowls. Cut the duck into slices, about 5mm thick, leaving the skin on, and divide between the bowls. Scatter over the seeds and serve straight away. Enjoy this on its own or add a poached egg or cooked chicken for a filling lunch. Cook the leeks and garlic in the oil and butter with a splash of water in a large saucepan over a medium heat for 10-12 minutes, or until soft. Add the remaining vegetables, tomatoes, thyme, beans and seasoning, and stir frequently for 10 minutes. Pour in the hot stock, bring to the boil then simmer for 30 minutes before serving. This salad looks beautiful if you open up a soft lettuce like a flower. 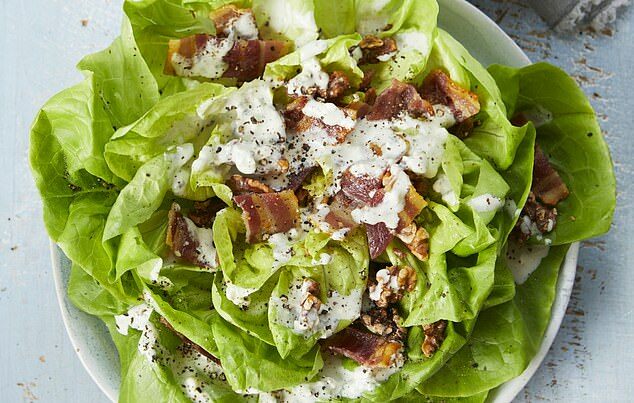 Butterhead lettuce is ideal, but you can also cut an iceberg into small wedges or use leaves of baby gem. It makes a satisfying lunch for four people, or can be divided into six portions as a starter. If you only have single or whipping cream, do use it but add less milk to achieve a pouring consistency. The dressing will keep in the fridge for three days. Heat the oven to 180c/gas 4. Put the walnuts on a baking tray and roast for 8 minutes, then set aside. Cook the bacon in a pan until crisp. Keep two tablespoons of the bacon fat in the pan. Cut the bacon into finger-width strips and put back into the pan. To make the dressing, mix all the ingredients in a food processor, briefly pulsing them; or use a fork to mash the cheese into the other ingredients in a bowl. Taste and adjust the seasoning as necessary. Arrange the lettuce on serving plates. Scatter over the walnuts. Reheat the bacon in the pan and pour it and the fat over the lettuce. Spoon over the blue cheese dressing, add a twist of salt and black pepper, and serve. Our salsa verde is equally good served with salad or a hot steak. The dressing will keep for a week in the fridge. Poach the chicken in a saucepan of salted boiling water for 10-12 minutes, or until cooked through. Make the salsa verde by chopping the parsley, garlic, anchovy fillets and capers, then tipping them into a bowl. Stir in the lemon juice and oil and season to taste. Put the lettuce in piles in four bowls. Lay the avocado slices next to them. Season the salad leaves and avocado with pepper, salt and a drizzle of olive oil. Add the wedges of lemon to the bowls. Lift the chicken out of the water and cut each breast into thin slices. Divide the chicken between the plates. Now pour the dressing over the chicken and serve. This is an ideal starter for entertaining. To make it more satisfying for lunch, add a poached egg or two to each bowl. Leeks are lower in carbs than onions and we love their sweet flavour. Use the ends of leeks and the asparagus in the soup. The cream enriches it and makes it more satiating. Do wait for the asparagus to be in season to ensure a good flavour. Trim the root and coarse leaves from the leek and put them into a saucepan with 1.5 litres of hot water to make the stock. Bring to the boil then reduce to a medium heat. Snap the woody ends off the asparagus and put these into the stock. Trim the heads from the asparagus and set aside. Put the chopped leek and celery into a saucepan with the butter and oil and cook slowly for 10 minutes. Chop the main stem of the asparagus and add these to the saucepan. Stir through and cook for 5 minutes. Use a potato masher to crush the asparagus ends in the stock pan to release the flavour. When they are soft, the stock is ready to use and can be strained into the saucepan with the vegetables. Let the soup bubble over a medium heat for 10 minutes, or until the vegetables are soft. Then purée with a hand blender until smooth. Stir in three-quarters of the cream, leaving the rest for the end. Sauté the asparagus tips in a small pan with a little more butter for 5 minutes. 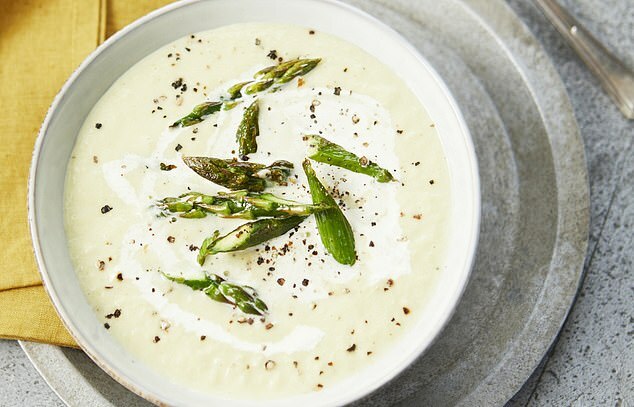 Ladle the soup into warm bowls and swirl in the remaining cream.Scatter over the asparagus tips and serve. The ‘banned’ foods you can now enjoy! You may be wondering how you can live without the carbohydrates you’ve been used to eating. But the good news is that cutting out starchy foods actually frees you to embark on a diet rich in variety and containing delicious foods you may previously have regarded as off-limits. Here, we look at the main foods you can look forward to enjoying. Protein is a source of amino acids that are used in the growth and repair of our bodies. We all need to eat good sources of protein — from animal foods and legumes to nuts, seeds, eggs and dairy. Our bodies also digest protein to give a steady release of sugar into our bloodstream — one reason a diet rich in protein can be good for someone with type 2 diabetes or high blood sugar levels. Another reason is that protein fills you up. 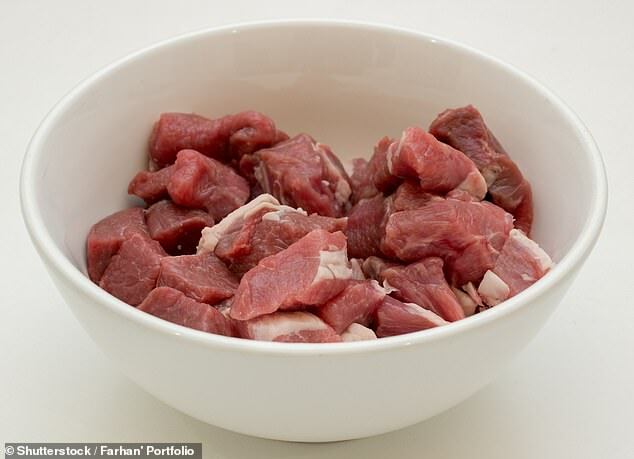 Animal proteins such as meat are nutritious — but you don’t need to eat a lot; a modest portion of 100g to 150g is plenty. 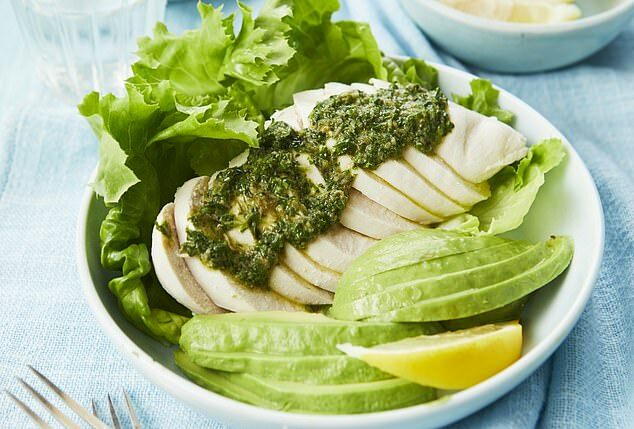 Fish is a fantastic source of protein and quick to prepare. Oily fish is rich in omega-3 fatty acids that are crucial for brain health and the nervous system. Try to eat oily fish, such as salmon, mackerel, anchovies, sardines and herring, at least twice a week. Non-oily fish, such as cod and sea bass, can also be enjoyed regularly. Eggs are good for brain and heart health. They are the star of a low-carb breakfast and The Diabetes Weight-Loss Cookbook has tempting morning recipes. Don’t worry that eggs might raise your cholesterol levels. Since 2000, the Department of Health has removed limits to weekly egg consumption, as long as you eat a varied diet. Fat has been seen as a culprit in weight gain because it is higher in calories per gram than protein or carbohydrate. But healthy fats from natural sources contain the essential vitamins A, D, E and K.
And it can be easier to manage your calorie intake with a higher-fat diet. There are two good reasons for this. First, eating more fat may help satisfy your appetite, so you eat less and feel less hungry. Secondly, digesting fat doesn’t drive up your blood sugar or insulin levels — which keeps your fat storage in check. Humans are designed to burn glucose or fat for fuel. 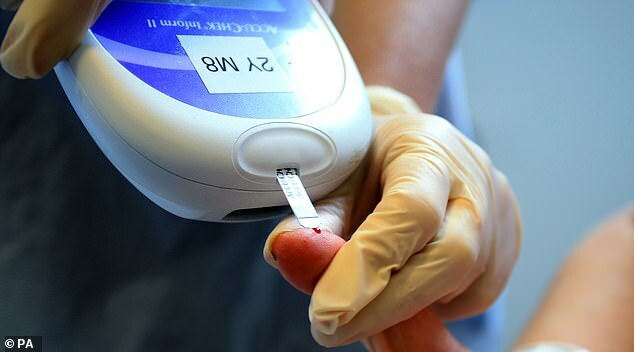 Someone with type 2 diabetes struggles to burn glucose — so being more of a ‘fat-burner’ can help get rid of that excess belly fat. 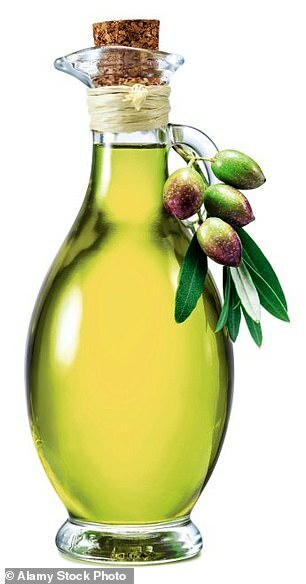 In addition to cooking with butter, you can use olive oil and coconut oil — and even animal fats such as lard. Using these fats makes food so tasty that you won’t want to return to your old high-carb lifestyle. But if you do want to lose weight, be careful to limit the good fats you eat. Avoid processed vegetable oils, such as corn and sunflower oil and margarine. They’re unstable when heated and linked to compounds that potentially damage cells and may cause inflammation. This food group includes beans and lentils. They are moderately high in carbs, so our recipes mix them with vegetables to reduce the spike in blood sugar they can cause. How frequently you enjoy pulses depends on your health goals and where you are on the CarbScale (see the quiz in yesterday’s supplement). If you’re on a strict programme to get your blood sugar levels under control, pulses are best avoided until these are stabilised. Exclusive videos: Watch Katie Caldesi cook new low-carb recipes — free for all Mail Plus members — here. Fruit can raise your blood sugar levels if eaten to excess, but there is a ‘spectrum’ of how sugary fruits are. Generally, berries are very low sugar and can be enjoyed even if you are on a strict low-carb plan. Many fruits such as pears, apples, peaches and plums are medium-carb. But take care with tropical fruits such as bananas, mango and pineapple. In terms of ‘sugariness’, whole fruits are superior to juice as the sugar in juices or smoothies is often absorbed faster. Vegetables are an excellent source of vitamins and minerals and they’re useful for bulking out your meals instead of starchy carbs such as bread, potatoes, rice and pasta. But it’s important to differentiate between non-starchy and starchy vegetables, including root vegetables such as carrot, parsnip, beetroot and sweet potato, that have a high sugar content. These can be eaten in restricted amounts; non-starchy vegetables such as kale, cauliflower, cabbage, aubergine, courgette and many others can be eaten freely. Dairy contains both protein and fat. Hard cheeses, such as parmesan, have one of the highest protein contents — 35g per 100g, compared to 16g in feta. 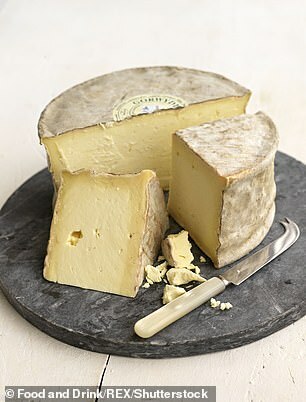 Do remember that cheese is calorific so don’t eat too much. Yoghurt is a great option as a pudding but opt for a natural full-fat version and add your own fruit. Low-fat fruit yoghurts can contain up to three times as much carbohydrate as full-fat Greek yoghurt. In the early days Dr Unwin worried about how consuming full-fat dairy and lots of eggs would affect his patients’ cholesterol and other blood fat levels, so he did hundreds of blood tests. He has data on more than 150 patients who actually show average improvements in these levels, the opposite of what he expected, and he is planning to publish these findings. Note: Always consult your GP before starting a new diet plan, particularly if you are taking any prescribed medication. Recipes by Katie Caldesi. 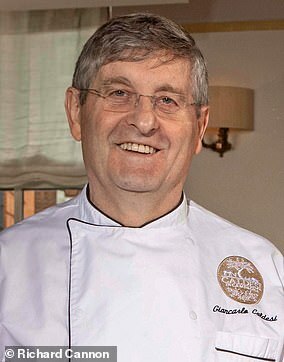 The Diabetes Weight-Loss Cookbook by Katie and Giancarlo Caldesi is published by Kyle Books at £20. To order a copy for £16 (offer valid until April 27, 2019; P&P free), visit mail shop.co.uk/books or call 0844 571 0640. DIY Makeup Tricks And Beauty Tips You Can Not Miss │Mind Blowing Ideas!